In Australia "raw milk", more commonly known as un-pasteurised milk, is mostly illegal for human consumption, except in one state, I do believe. The consensus appears to be that pasteurising the milk makes it safer to drink, but many argue (mostly farmers and a few scientists) that raw milk is safe to consume. There are many arguments and claims, but from what I've read pasteurised milk has caused more bacteria poisoning scares than un-pasteurised milk. People that grew up on a farm or still live on a farm have been drinking un-pasturised milk for decades and seem to have remained in good health. Is drinking raw milk really more dangerous than drinking pasteurised milk? The CDC recently released statistics for the first time on raw milk consumption, and raw milk-related illnesses. They also released their own conclusions, which, ironically, don't match their own data. However, an article released a couple weeks ago, Raw Milk Reality: Is Raw Milk Dangerous? attempts to examine the best numbers available from the CDC and other sources, and does its own analysis of the relative safety of raw milk compared to other foods, and specifically, pasteurized milk. The data from these two articles don't completely agree with each other. It's not clear where the discrepancy lies. What seems clear from my research, though, is that there has not been a single confirmed raw-milk releated death in the U.S. since the 1980s, despite CDC claims to the contrary on their web site. The CDC has even admitted their propaganda is wrong. Using the best data currently available, strictly from a food-borne illness standpoint, consuming raw milk carries roughly 9.4 times higher relative risk than consuming pasteurized milk. But in absolute terms, both risks are incredibly small, with raw milk carrying a 1/94,000 (0.001064%) chance of illness, and pasteurized milk carrying a 1/888,000 (0.000113%) chance of illness. For many, the touted benefits of raw milk (more on that in my old answer below) are worth the added 0.000951% chance of food-borne illness. Pasteurized milk may contribute to many ailments, including lactose intolerance, allergies, asthma, frequent ear infections, gastro-Intestinal problems, diabetes, auto-Immune disease, attention deficit disorder and constipation (source). Traditional dairies, and in particular those which also use rBGH, often administer large amounts of antibiotics to their cows, which typically gets into the milk, exposing the human consumers to unnecessary antibiotics. The risks of over-exposure to antibiotics is well documented. The main concern is in making antibiotic-resistent "superbug" strains. (source). Note that the last two (rBGH and antibiotics) can also be avoided by purchasing organic pasteurized milk. Short answer: No. In fact, pasteurized milk is often more dangerous than raw milk. Long answer: Of course, it depends. Raw milk is not inherently dangerous at all. The reason for pasteurization is not because milk is, by nature, a dangerous product to consume. Pasteurization is done for two basic reasons: 1) To kill any living contaminants, and 2) to extend shelf life. Because pasteurization kills most bacteria (good and bad) contained in the milk, it won't go bad as quickly. The down side to this is, when it does begin to sour, it goes rancid, and is no longer fit for human consumption. On the other hand, when raw milk begins to sour, it isn't actually "bad" immediately, because the live cultures in milk prevent it from going rancid so quickly. Many foods we take for granted are various forms of "sour" milk--Yogurt, Cheese, sour cream, etc. And if you consume raw milk, and it begins to sour, you can still use it to make many of these milk products. Fermentation starts digesting the milk protein casein, and digests some of the lactose. Souring of [raw] milk does not destroy any of milks beneficial properties. Pasteurized milk gone bad will kill you - raw milk won't.....pasteurized milk rots. Now, the reason for pasteurizing milk is to kill harmful living organisms. However, it also kills most of the beneficial living organisms in the milk as well. This can, in some cases, actually lead pasteurized milk to be more dangerous than raw milk. Pasteurized milk is harder to digest, especially for those who are lactose intolerant or with digestive disorders. Today, milk is made even more indigestible by the universal practice of pasteurization, which destroys its natural enzymes and alters its delicate proteins. (source). Due to high-volume distribution and its comparative lack of anti-microbial components, pasteurized milk when contaminated has caused numerous widespread and serious outbreaks of illness, including a 1984-5 outbreak afflicting almost 200,000 people. In 2007, three people died in Massachusetts from illness caused by contaminated pasteurized milk (Real Milk PowerPoint, slide 30). [I]t appears obvious that we have arrived at a point in [the United States] when the dissemination of bovine tuberculosis is no longer a matter of serious concern. (source). Ironically, raw milk is actually beneficial in fighting TB in humans. Real Milk PowerPoint, slides 54-56, 58. At the time pasteurization was initiated, many (if not most) of the dairies in the U.S. (and much of Europe) were filthy, and sanitation was abysmal, leading to much contamination of milk during milking and bottling. Since the invention of closed-system milking machines in the 1940s, it is possible to eliminate the most serious exposure to external contamination. Other factors affect the relative safety of raw vs. pasteurized milk as well. This site describes how a cow's diet has a strong impact on the pathogen-fighting ability of the milk produced, and as such, milk from cows fed diets heavy in heavy in grain, soybeans and cottonseed meal (common in many commercial dairy operations) must be pasteurized to be safe. This 132-page report examines the various scientific studies that supposedly cast a shadow over raw milk, and tries to interpret them with less (supposed) bias. 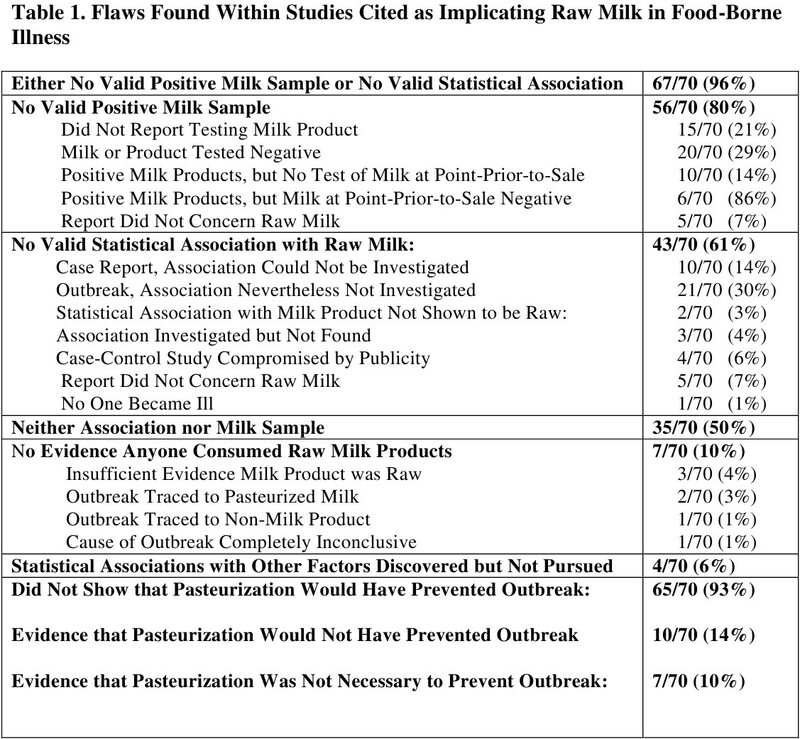 The following table is taken from page 6, and shows the results of examining 70 studies purported to show the dangers of raw milk, and the various flaws in many of the reports. The paper goes on to address each of the 70 studies point-by-point. BJM ref 10, Review p.41 - Contaminated raw milk was discovered, but not in milk intended for sale as raw milk. BJM ref 12,18, Review p.42 - "This is a review rather than a primary reference." and "There are no outbreaks mentioned in this review that could be said to be conclusively linked to unpasteurized milk, and in most cases the suspected milk was intended for pasteurization." Between 1998 and 2005, raw milk was associated with 0.4% of CDC-documented food-borne illnesses, including 831 illnesses, 66 hospitalizations, and a single death. (Response to the FDA, p. iii,5) Clearly raw milk is not "perfectly safe," but neither is any other food. In conclusion, if you can find a clean source of raw milk from healthy, well-fed cows, it is probably safer than the pasteurized milk you can find at the supermarket. On the other hand, if your raw milk is unsafely handled, or comes from unhealthy cows, it may be harmful. But that's really just common sense--we all want to eat clean food, right? And as many others have pointed out, enforcing proper quality control on raw milk can be very difficult--although it has been done in many large-scale commercial operations, but usually along with a higher price tag. 2 Professor Tyson, James. Journal of the American Medical Association. June, 1884. There has been a similar debate in the UK (for an argument in favor see here). Moreover few doubt that unpasteurised milk tastes much more pleasant and it may even be more nutritious (for the nutrition argument see here). Beware, though, of some of the positive health claims made by the "raw milk" movement as they smack of the lack of skeptical analysis common in many "natural is best" arguments. Infections carried in milk, particularly salmonellosis and campylobacter enteritis, have continued to feature in Great Britain in recent years. Less commonly reported infections included an outbreak in 1984 in England due to Streptococcus zooepidemicus, in which 12 people, eight of whom died, were admitted to hospital. The implementation of legislation in 1983 requiring heat treatment of cows' milk for sale to the public reduced the incidence of milkborne infection in Scotland compared with previous years and compared with England and Wales, where, without legislative control, outbreaks continue to occur. So there are risks which are not common, but are serious when they occur. Most people who drink raw milk will never experience them, but if you are going to choose to drink it you probably should do so knowing the small probability of danger. Eighty-three fluid milkborne outbreaks were reported between 1990 and 2006, resulting in 3621 illnesses. The mean number of illnesses per outbreak was 43.6 (illness range: 2-1644). Consumption of unpasteurized milk was associated with 55.4% of reported outbreaks. Give that other estimates of milk consumption suggest that raw mile is <1% of total volume, this suggests it is between 50 and 100 times riskier. It is worth noting that it also addresses some of the spurious positive claims for raw vs pasteurised milk (such as the ridiculous claim that pasteurisation causes lactose intolerance). I don't know if this is still a valid reason to pasteurize milk, but it seems like a small price to pay. It is important to clarify the comparison. On one hand, it appears that store bought pasteurized milk is safer than farm bought raw milk. However, this may be due to the fact that farm bought milk is not subjected to the same regulations as store bought milk. Indeed, in many states, raw milk is sold as 'pet food' to circumvent regulations intended to protect public health. To the consumer, it is important to understand the risks associated with milk processing and distribution. Pasteurized milk products have occasionally caused illnesses and outbreaks. Usually, this has happened because of germs introduced in the dairy after the pasteurization process. Pasteurized milk that is correctly handled in the dairy, bottled, sealed, and refrigerated after pasteurization, and that is properly handled by the consumer, is very unlikely to contain illness-causing bacteria. Considering the amount of pasteurized milk consumed in the United States, illness from it is exceedingly rare. However, there is a notable lack of evidence available to compare the danger of pasteurized vs unpasteurized milk that have passed similar regulatory testing prior to sale. One of the largest producers and commercial sellers of raw milk presents the (apparently unpublished) results of tests for pathogens that indicate they have never found dangerous levels of pathogens in their milk (one exception being outsourced milk that they used for cheese, but in this case they did not used the contaminated milk). The answer is yes. The reason is that raw milk potentially has more harmful bacteria than pasteurized milk. Getting rid of potentially harmful bacteria is the main reason we started pasteurizing milk. Now, there are two parts to this. What bacteria and their amount, and how harmful the potential infection will be. Even a very carefully managed farm may occasionally find potentially harmful bacteria in the milk. Unless every batch is monitored before consumed you cannot really be sure. Among the more harmful bacteria that might be found are tuberculosis (Mycobacterium tuberculosis), EHEC (several species of E. Coli), Salmonella, Listeria and so on. When pasteurizing the milk, these bacteria are killed. If the raw milk is free from these disease creating bacteria, you will of course not get sick from them. The second part is how sick you will get from the bacteria. This is dependent to a large part to your general health state and also to how well your immune system is able to cope with the infection. An healthy adult ingesting EHEC bacteria might get a diarrhea and recover in a day, a sickly elder person might die. Another example is tuberculosis. In older times this was a chronic disease that could not be eradicated from the body and a common cause for premature death. In modern times, a regime of various antibiotics has made this disease look harmless. But lately the world has seen strains of totally drug resistant TBC WHO as of July 2018 uses the term extensively drug resistant. The risk of you contracting this from raw milk in "western societies" is very low, maybe non-existent. But I would not bet on that being the same in every farm the world has. So, yes, you take you chances drinking raw milk. Admittedly, the risk is very low but to answer the question: "drinking raw milk is more dangerous than drinking pasteurized milk", the answer is yes. But always remember, that risk (or chance) is a number between 0 and 1 (from cannot ever happen up to will happen every time). In this case it takes two numbers to become sick, you need to receive the bacteria in suffixet number and your immune system needs to not be able to handle the infection. Opastöriserad mjölk benämns ofta "mer naturlig" och därför extra bra för hälsan. Men det är stor risk att opastöriserad mjölk sprider olika bakteriesjukdomar. De är särskilt allvarliga för små barn, gravida, äldre och personer med nedsatt immunförsvar. Google translate Opa-buttered milk is often termed "more natural" and therefore extra good> for health. However, there is a high risk that unastasted milk spreads differently> bacterial diseases. They are particularly serious for young children, pregnant,> elderly and people with impaired immune system. Not the answer you're looking for? Browse other questions tagged nutrition safety milk .